For the past six months with the support of The Lunenburg School of the Arts and Arts Nova Scotia, through their Creation Grant Program, I have been able to explore the possibilities of fine layered sculpture. Within my work over the last few years I have been going back and forth between sculptural and functional ceramics. I have made various sculptural attempts at creating a light, almost skeletal, geometric ceramic form that changes and reveals different aspects as you walk around it. However, I have never been truly satisfied with the end product. From this work I then moved onto surface decoration and this is how the structural aesthetics have been manifesting up until now. As a student of printmaking as well as ceramics, I have always been interested in the possibility of crossover between the mediums. The surface decoration on my functional work is created with many layers of intricate handmade paper cuts as stencils between each layer of coloured slip. The ceramic medium has a decidedly utilitarian history which has stood in strong contrast to the fine arts in the discourses of the art world. The surface of the pot, though artistically similar in process to painting or printmaking, has not always commanded the same respect as these practices. This begs the question of why a painting of a pot could be held up as fine art, but the pot itself would not meet that same standard. In an exploration of the answer to this question, I am taking the decoration I would normally apply to the ceramic surface and allowing it to stand alone. I will subtract the traditional vessel from the ceramic decorative materials and make the decoration the object. Kara Highfield is a Ceramics Artist living in Lunenburg, Nova Scotia. She received a Bachelor of Fine Arts (2013) from NSCAD University with a major in Ceramics and a minor in Art History. 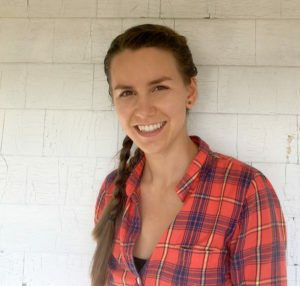 Kara is currently Artist-in-Residence at the Lunenburg School of the Arts completing a sculpture project funded by Arts Nova Scotia through the Creation Grant program. Kara has exhibited her work across Canada, most recently at Medalta International Exhibition, Dish, celebrating what ceramics brings to the table, juried by Julia Galloway (2017-2018). Kara’s work has been published in The Crafted Dish, a book highlighting Canadian ceramics published in partnership with National Clay Week (2017). She is an alumni of the year long NSCAD – Lunenburg Community Studio Residency Program. Kara has been an instructor in ceramics at The Lunenburg School of the Arts since 2016.